Oh these Snowmassholes…. (read the series, you will know what I mean) of them all, I know I love Nick Frost the mostest! 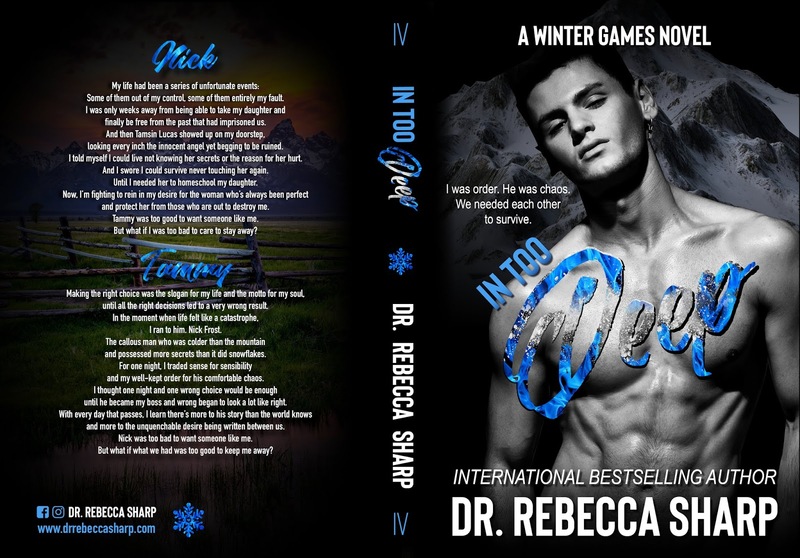 In Too Deep is the story I have been waiting, oh so patiently for, of Nick and Tamsin. I admired Tammy’s quiet strength. I could empathize with her need for rules and her OCD tendencies. Her need for control when parts of her life were uncontrollable. I also admired Nick’s protective streak, even when it was a detriment to himself and those around him. I also empathized with his need to try to control the uncontrollable in his world. He is a complicated chaos personified and just what Tamsin needed. I loved the slow burn aspect of Nick and Tammy’s relationship. You could see how hard Nick was trying to “protect” Tammy from himself at the expense of himself. You could feel Tammy’s loving and caring for both Nick and Lila, even at the expense of herself. The words and deeds that Nick gave to Tammy were swoony and absolutely amazing…I am not going to quote the book and spoil it, but trust me when you read his words to her…just swoon, melt and whew…. This book is part of a series, true, but can totally be read as a stand alone. Don’t let the series part scare you into not reading this book! It’s amazing, moving and just wow.